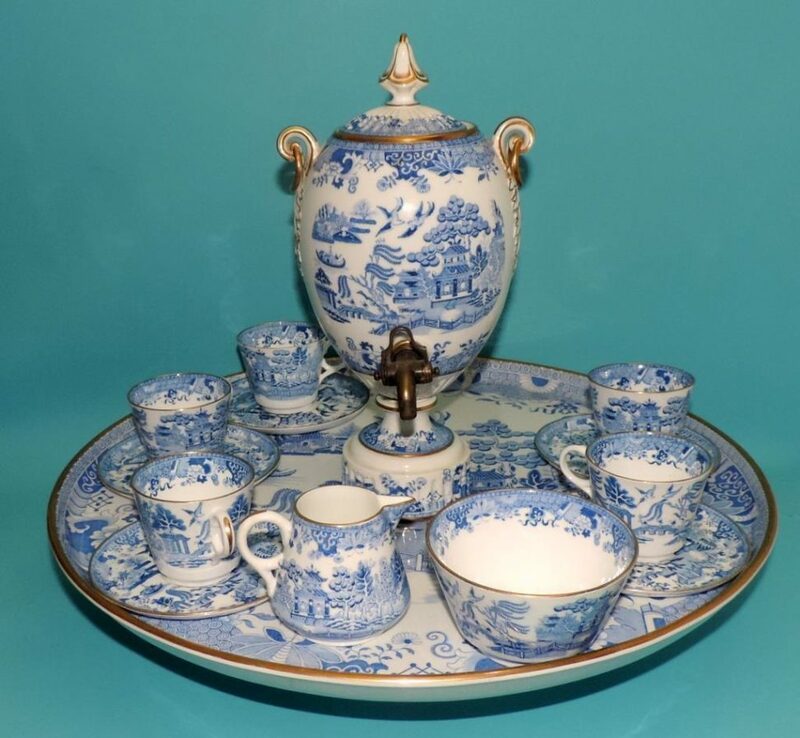 The popularity of tea sets imported from China spurred British potters to copy their style of decoration. The first willow design may be attributed to Thomas Turner of Caughley Porcelain in 1780. 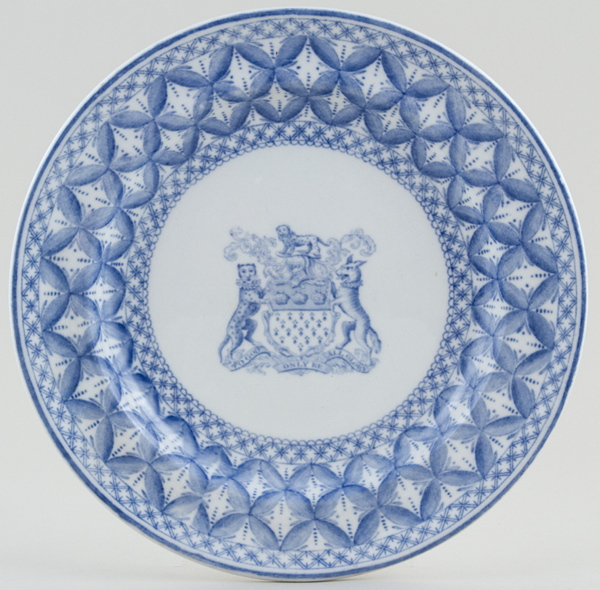 William Spode and Thomas Minton both copied his pattern in 1790. The most popular colour was blue, followed by pink, green and brown. It is always on a white background and the pattern is applied as a transfer. Dating specific Blue Willow pieces is extremely difficult. Many early pieces were not marked. The body type, glaze, and patterns of the piece give clues to wether it is from early, middle, or late eras. On older examples you will often find spots on a plate where the transfer has slipped, creased or been badly joined up. Copeland states the blue of early patterns was very dark. 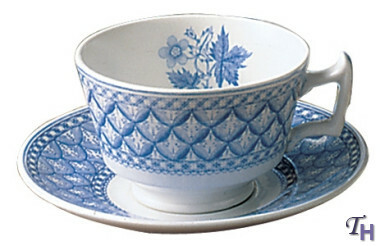 Through the years when manufacturing the process became more precise the pattern was produced in many shades of blue. 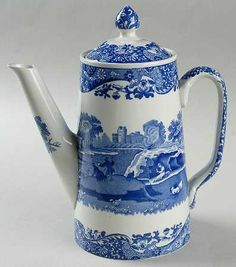 The romantic fable associated with the pattern, and probably invented by Spode, has it’s origins in England and has no links to China. The most popular version is a tale of star crossed lovers; a wealthy mandarin’s daughter and her father’s lowly accounting assistant. When the father discovers their love, he fires the assistant and builds a fence around his property to keep him away. You’ll always see a fence around the teahouse. The boat in the pattern carries a rich duke, who arrives with a chest of jewels and plans to marry the girl. The lover sneaks in and steals the jewels and the girl. You see the couple running across the bridge to escape to an island, but the father is close behind with whip in hand. The couple are killed. The first versions didn’t include the two birds. Later versions had the gods taking pity on the lovers and allowing their souls to take the shape of doves and fly off together. 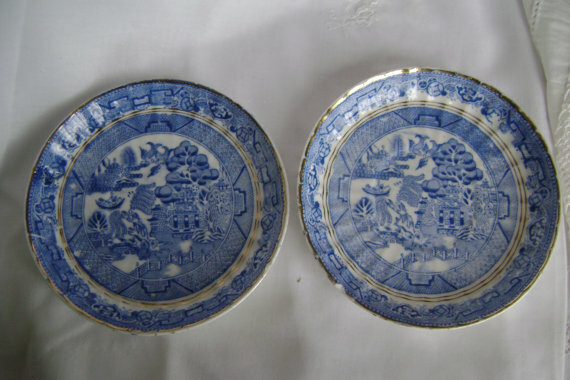 Two antique blue and white English china Willow Pattern saucers. There is a very intricately patterned fluted rim, then an inner gold band and an inner geometric oriental pattern. 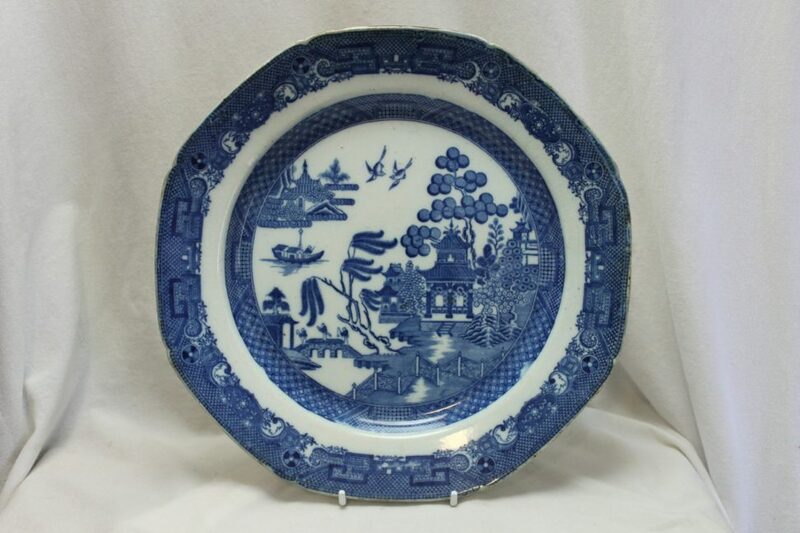 In the centre is the willow pattern. 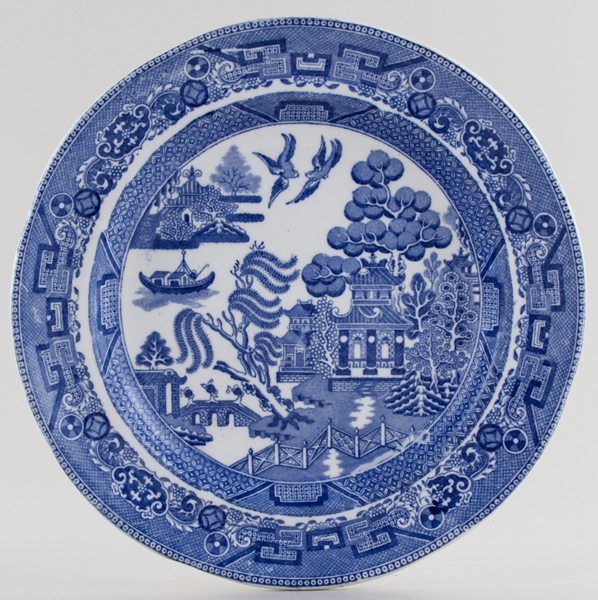 The colour of blue is paler in one saucer and the transfer although the same pattern is clearer in different parts of each plate, all suggesting early manufacture. There is no makers mark, early examples are often unmarked. Probably an early example of Charles Allerton.